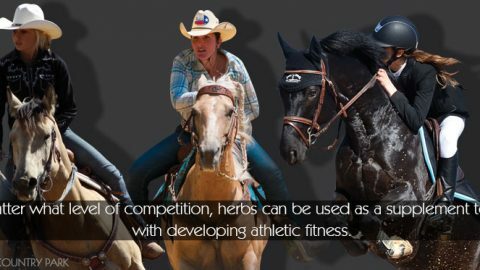 From a herbal perspective we don’t necessarily suggest the same herbs for a specific problem with every horse. For example, with Queensland Itch, the herbs one owner may use with their horse may not be the same as the herbs that work for the neighbour’s horse. This is because herbalists look at the whole horse and often the expression of itchy skin gives other indicators that help the herbalist decide the best possible combination in each case. 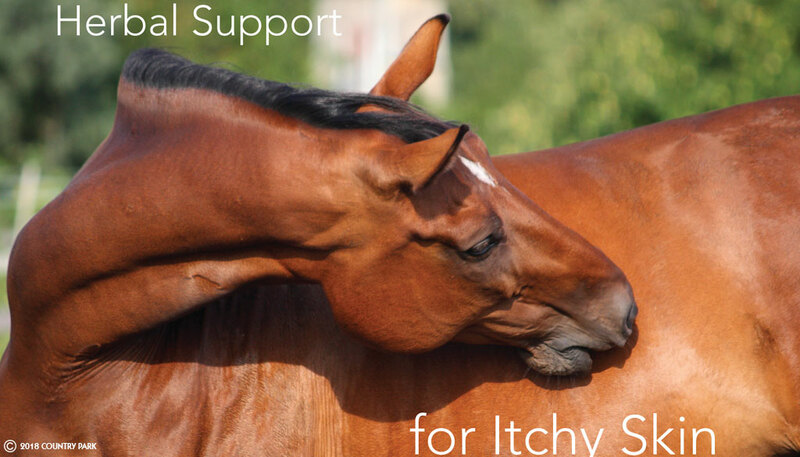 When addressing itchy skin conditions looking at body systems can be an effective way to make a horse more comfortable. The skin is the largest elimination organ and if another body system is not able to cope and overloads the skin’s elimination processes the horse can develop an itch or rash. Skin issues can be a sign that there is a need to support the lungs, liver, kidneys or bowel within the overall herbal approach. With itchy skin the first body function to question is “what are your horse’s poops like”. If they are not healthy, then we need to address the digestive tract with mucilaginous herbs such as marshmallow or slippery elm bark. If the horse developed an itch after a long term or intense respiratory infection these two herbs also have a reflex action on the lungs and can be used with herbs like mullein which is also demulcent to bring tone to the lungs and assist the elimination of toxins via respiration so that the skin no longer has to struggle with eliminating the toxins normally breathed out by the lungs. If a horse has a skin problem and has a history where he may have needed cortisone injections for an illness or lifestyle reasons, then we may need to address how the kidneys are eliminating wastes from the body, parsley leaf can be a key herb when formulating your approach. Then using clivers for the nutritive properties and to assist lymphatic function, with the lymphatic system being the ‘garbage system’ of the body, further improves the integrity of the skin. The liver is the master organ in the body with burdock a liver herb that helps the skin, you can use with most skin combinations. Burdock root is also a blood cleanser which can assist with the elimination of wastes via the circulatory system rather than the skin. Powdered burdock root can be added to feed, or the shaved root can be made into an infusion and then poured onto your horse’s feed daily. This can help if the skin has become dry and flaky or where the liver has been a bit sluggish with its function. Itch responds well to nettles which can be used with itch that becomes worse with hot weather or after exercise. In the majority of cases, nettle helps improve the integrity of the skin with broad nutritional value so that the skinis less vulnerable to itch. Botanically nettles’ name urticaria reflects its use with urticaria-type skin issues. Topically a decoction made from the shaved root of marshmallow can be sprayed onto irritated skin to soothe irritated skin. Decoctions made with roots or barks need to be simmered for 20-40 in a saucepan with the lid slightly open so as to avoid boiling. To make 1 litre of spray use 6 to 8 tablespoons of the dried root and it will last you a few days if stored in a cold place. If the skin has become infected or the skin rubbed raw calendula petals can be added to this decoctionin the last ten minutes of the simmering process and the dried petals can be added to feed to assist the internal healing processes of the skin cells. Rosehips with tonic properties will improve the condition of your horse’s coat and can be added at any stage of a horse’s recovery. For the time-poor owner, Country Park’s Summer Blend contains marshmallow root, rosehips, dandelion leaf, clivers and calendula petals; which in combination can be used to support and strengthen the skin’s immune system with horses prone to itch. It is also a useful blend to give through the non-itch months to strengthen a horse’s skin before the onslaught of seasonal itch. This blend can be supported with turmeric powder if needed, and sometimes if there is a flare up of the itch while on any of the above mentioned herbs, turmeric powder incorporated into the approach can assist the liver with low grade inflammation of the skin. With repelling insects that may cause some of the itch issues, you may want to consider adding brewers yeast to a horse’s feed, this helps make the blood less tastier to biting insects. The best strategy with any skin itch problem is to be flexible as it can be fickle with how it responds to herbs and making small changes in your approach can be needed if your horse needs the herbs long term. For correct dosage rates on the herbs mentioned in this article please contact Carol or Ruth when placing your order. Disclaimer: The information provided in this article is for educational purpose only and is not meant to replace veterinary advice or treatment. Copyright: Catherine Bird, who is also the author of a Healthy Horse the Natural Way, has been an equine natural therapist for 27years working closely with Country Park Animal Herbs for over 13 years offering advice to their clients.